The Vietnamese General Department of Taxation (“GDT”) has updated its Non-Member Country Positions (“NMCP”) to the OECD Model Tax Convention Countries. NMCPs are from countries that are not a member of the OECD, but nevertheless, express a view on the text of the widespread OECD Model and OECD Commentary. These NMCPs are published by the OECD. Vietnam has already published its position in the earlier versions of the OECD Model, but the 2008 update by the GDT has just been made available. It offers a rare opportunity to get a sense of shifts in DTA (double taxation agreement) policy of the GDT. Under the OECD Model, a non-resident selling shares issued by a company in another state will not be taxable in the state where that company is situated. 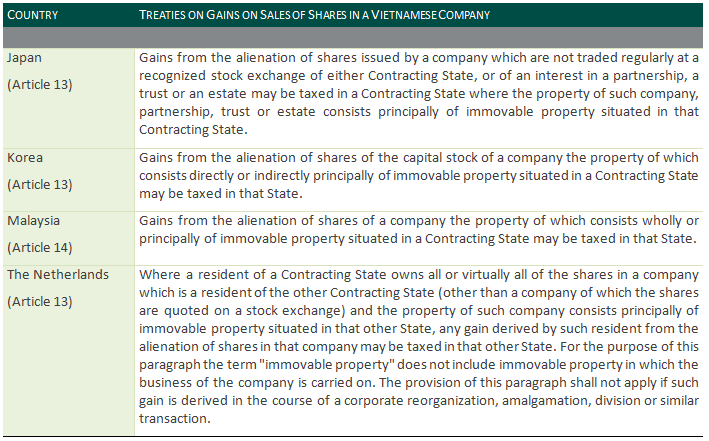 For example, the gains from a sale of shares by a Singapore holding company in a Vietnamese company will not be taxable in Vietnam according to the Singapore-Vietnam DTA. However, Vietnam has only rarely followed the OECD Model in its treaty practice. Most Vietnam DTAs follow the UN Model, which provides for more taxing rights for the source state (i.e., the state where the company is established). Judging from Vietnam’s NMCP, the GDT is now proposing an ever tighter grip on real estate companies. For new DTAs, Vietnam reserves the right to put the threshold to determine whether a company “principally holds property” at only 30%, not 50%. This 2008 NMCP update will be taken into account for future negotiations and renegotiations of Vietnam’s DTAs. One of the more remarkable updates is that the GDT now notified the OECD that it reserves the right to include technical fees in the definition of royalties. Vietnam’s previous NMCP did not feature this reservation. Under the OECD Model, the country from where a technical service fee is paid does not usually have the right to tax such fee. Normally, only if the fee was realized through a PE in the source country would that country be allowed to tax. Thus, in the case of DTAs with Vietnam that follow the OECD Model, Vietnam cannot tax technical fees paid to a recipient in the other country unless there is such a PE. Vietnam has succeeded in including a provision allowing a withholding tax on all technical fees with some countries (for example, Malaysia), but most of Vietnam’s DTAs still follow the OECD Model. By this new NMCP, the GDT makes it clear that it will insist on this point in future negotiations. Vietnam also added a new NMCP that payments for the use of “films, tapes or digital media used for radio or television broadcasting” may be included in the definition of royalties.